"I WILL not sell my kid's future." 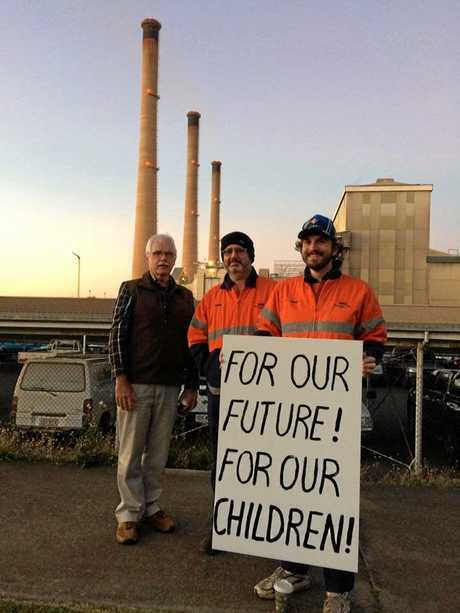 This was one of the many strong messages Gladstone Power Station workers sent when they protested outside their workplace at dusk today. It's the latest in the ongoing battle over operator NRG's proposed changes to the site's Enterprise Bargaining Agreement. Gladstone Power Station protest : Workers and union members stood outside the Gladstone Power Station this morning waving flags and holding signs, protesting against changes to the site's EBA. Today NRG will meet with the Fair Work Commission and union members for a conciliation meeting over the bargaining process, that has lasted eight months now. This week the results of a Protected Industrial Action ballot revealed workers voted in support of strike action. Meanwhile NRG has made an application with the Fair Work Commission to terminate the current EBA. 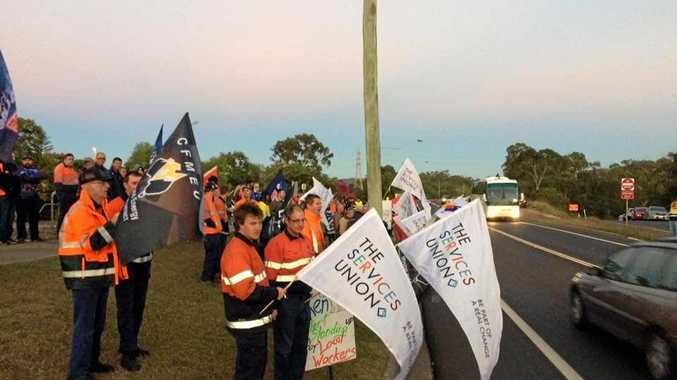 Workers from the power station and other industries in Gladstone protested for one hour outside the site, lining the road holding signs and flags. The Services Union secretary Neil Henderson attended, and declared their power station members were ready to take on NRG. "We are up for the challenge and the fight," Mr Henderson said. "NRG is demonstrating it has little connection to Gladstone and its people. "NRG management can try every trick in the book, but what they underestimate is the resolve of union members."